We have recently added Cryptic Crosswords to the selection of crosswords that we offer. 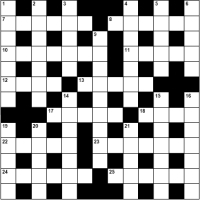 To create a good cryptic crossword takes an experienced crossword setter some considerable hours to craft. Our compiler has many years experience in and around cryptic crosswords and solving even the toughest cryptic crosswords there are out there. If you are interested in purchasing cryptic crosswords for your publication, please in the first instance Send us your requirements.